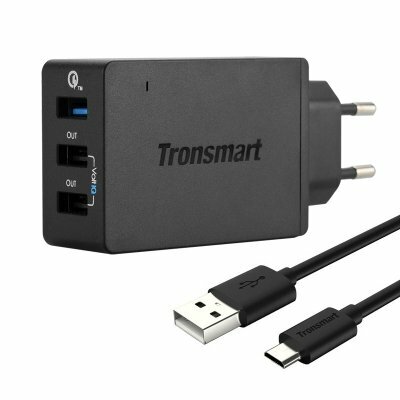 Successfully Added Tronsmart Three Port USB Wall Charger - Quick Charge 2.0, VotIQ, Over-Current, Over-Charging, Short-Circuit Protection to your Shopping Cart. Over-current, over-charging and short-circuit protection will ensure you charge safely, without any risk of damaging your devices. As the number of mobile devices we use is on the rise, so is the demand on plug sockets increases. Many portable gadgets can now be recharged through USB connections and to take advantage of this the Tronsmart WC3PC lets you economize on ports and charge up to three devices at the same time. Connecting to a standard EU socket this powerful little plug has some great advantages that will get your gadgets recharged in no time. Utilizing Qualcomm Quick Charge 2.0 technology lets you reduce the amount of time it takes to charge devices. When you connected a device from the ever growing list of Quick Charge 2.0 enabled products you can enjoy charging times up to 75% faster than with standard USB leads. In tests this has been proven to charge 60% of a 3300mAh battery in as little as 30 minutes which is a phenomenal time saving when put alongside standard USB ports that can only output 5Volts or so. This possible because the Quick Charge 2.0 port can deliver of 5V, 9V or 12V of power at varying amps to charge your devices faster. Along with one Quick Charge 2.0 USB port the Tronsmart WC3PC Wall charger has two VoltIQ USB ports. These are can automatically identify the required power level for each connected device and deliver the best power output for the most effective charging. In total the Tronsmart can deliver 42 watts through 1 Quick Charge 2.0 port and 2 VoltIQ ports and has Over-current, over-charging and short-circuit protection to safe guard against any possible risk of damaging your devices. If your products aren’t currently Quick Charge 2.0 supported then the charger will still connect with them and charge them as its fully backwards compatible. This Tronsmart, three port USB wall charger with EU plug comes with 12 months warranty. Brought to you by the leader in electronic devices as well as wholesale chargers and phone accessories, Chinavasion..